Turn scowls and negativity into smiles and positivity! Teach complainers and pessimists to overcome bad moods or feelings of hopelessness by changing their outlook. 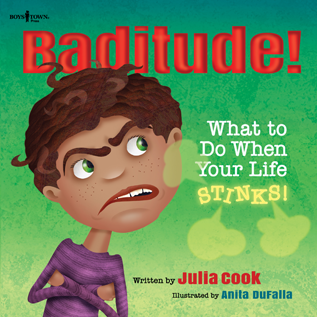 Learn from Noodle, a boy whose attitude, or “baditude,” is alienating everyone around him. With help from a teacher and his mom, Noodle learns how to turn his ‘have tos’ into ‘get tos’ and his ‘baditude’ into gratitude! Kids in grades K-6 are empowered to actively look for positives in all situations and manage how they choose to feel about what they cannot control. This title is from the Responsible Me! series, which promotes life skills, strengthens character development, and helps kids use better social skills at school and at home.